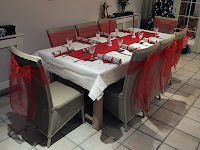 Mrs M took command of the kitchen for Christmas dinner. The oven commenced operation at 08.30hrs while I distributed presents to the family once the girls had dragged themselves out of bed. Christmas dinner featured pigs in blankets, stuffing and roast potatoes. There were some extras including turkey, gay (sweet) potatoes, some green things and sauce made out of bread. Despite being full to capacity, chocolate mousse and Christmas pudding were also dutifully consumed. After dinner, we rolled to the lounge for a rousing came of pass-the-parcel. Mrs M had bombarded Amazon (and the bank account) over recent weeks with purchases related to bodily parts as forfeits and prizes. In combination with last year’s ‘poo’ theme, our ‘recommended items’ list on Amazon is quite amusing. This year’s parcel forfeits included the wearing of comedy breasts, a red wig, ski gloves and a particularly attractive pair of ‘willie pants’ which were unexpectedly appreciated by G.
The rest of the day was spent in food comas but most of the family were awake for the evening presentation of ‘The Best Exotic Marigold Hotel’. The volume had to be increased due to the snufflings of a small hippopotamus from the corner of the sofa.